Stock indices in South Africa are witnessing record highs. The JSE All Share Index touched the 58,000 level for the first time on October 16. Meanwhile, the MSCI South Africa Index is up nearly 15% on the year. It is quite a distance behind the MSCI Emerging Markets Index, which has gained 30% in the year so far, but it has done much better than country indices for Qatar, Pakistan, and Russia – all of which are in the red. It has also outperformed Indonesia (12.8%), Malaysia (12.6%), Colombia (11%), Greece (10.9%), the United Arab Emirates (6.3%), and Egypt (1%) as well. Given the political and economic quagmire the country finds itself in, this is quite a commendable feat that the stock market has achieved. 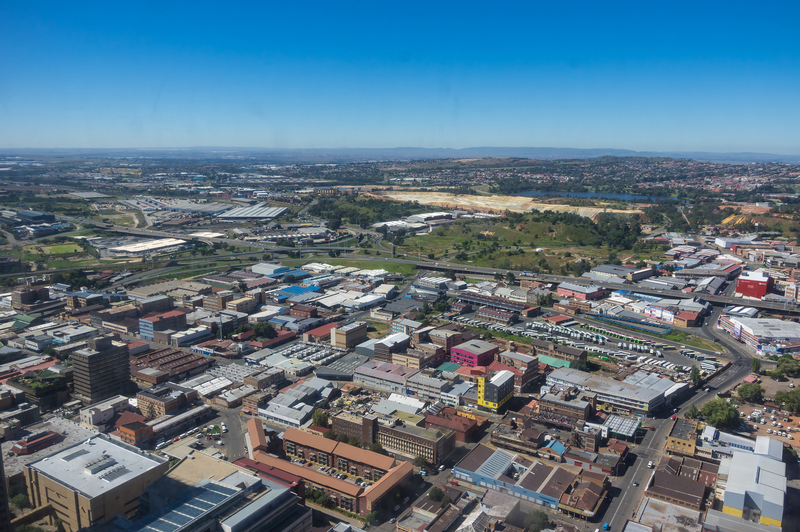 However, equities in South Africa are not looked fondly upon by foreign capital. 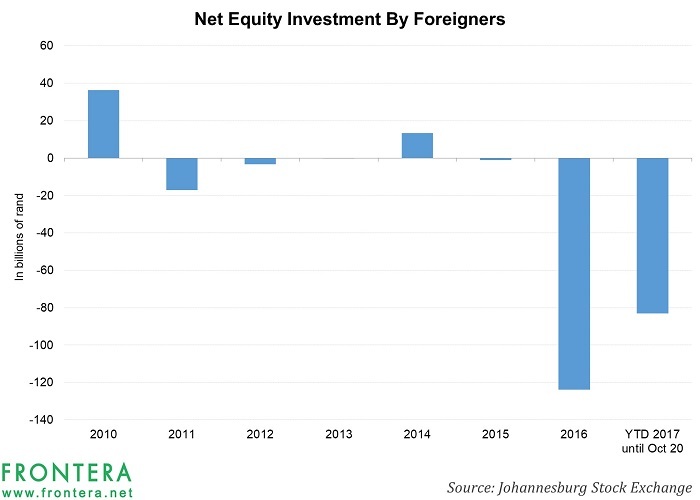 The graph below shows the net purchases/sales by foreign investors in the equity segment of the Johannesburg Stock Exchange. For the week ending October 20, the stock market has seen net outflows of $83 billion rand ($6.1 billion) from foreign investors in 2017 even after a record-setting year for local equity indices. In the same period last year, foreign investors had pulled out $101 billion rand ($7.3 billion) from equity markets. At the end of September 2017, net outflows had stood at close to $90 billion rand ($6.6 billion), but some buying in October has reduced net outflows from a country which is the sixth largest in the emerging markets universe. One would need to look back to the turn of this decade in order to find any meaningful net purchase amount in the equity segment. For a year with net purchases worth over $50 billion rand ($6.5 billion at the time), one would need to go back to 2009. Exchange-traded funds investing in South Africa have attracted net inflows amounting to $30 million in YTD 2017, according to Bloomberg data. The top three funds in terms of net inflows are listed in South Africa and are CoreShares Top 50 ($41 million), Satrix 40 ($22 million), and New Gold Platinum ETF ($20 million). However, the sole ETF listed on US exchanges – the iShares MSCI South Africa ETF (EZA) – has seen outflows worth $41.3 million in the year so far. To provide a perspective, in a year in which emerging market ETFs have outshone their developed market peers, country-focused funds have seen inflows worth $2.6 billion in this year so far, according to Bloomberg data. Brazil leads the universe with the iShares MSCI Brazil Capped ETF (EWZ) having witnessed net inflows of $1.6 billion in YTD 2017. In the next article, we will look at the status of South African bonds and what the future holds for both these asset classes.